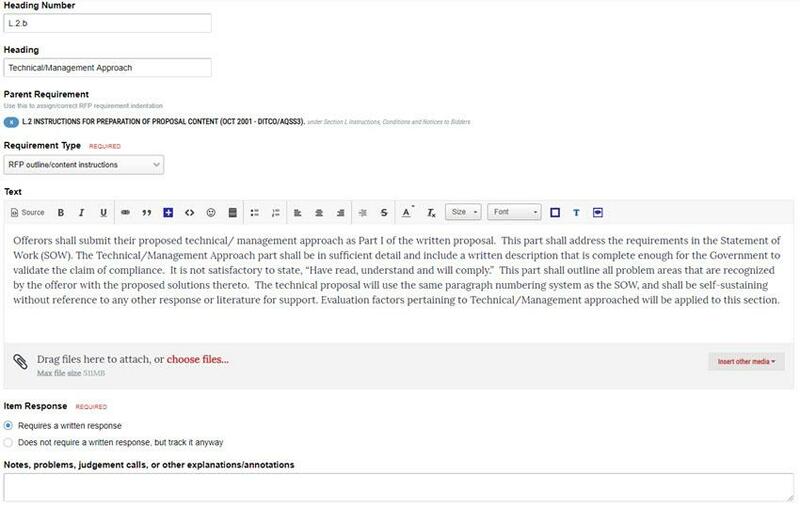 This form above is what you use to enter or edit an RFP requirement in MustWin Now. The key is how simple it is. Just enter the RFP section number and text. The parent requirement is for indentation level, which you may not have to enter at all since when you click the "+" symbol in the column with the RFP requirements, MustWin Now knows who the parent is. Then pick whether it's an instruction, evaluation criteria, performance/delivery requirement, or other requirement from a list. This will help categorize the RFP items for cross-referencing. And if you see an RFP item that's really just providing information and doesn't require a written response, you can flag it so the writers will know. Copying and pasting the RFP into MustWin Now. This goes very quickly. The hardest part is understanding the customer's often inconsistent RFP heading numbers. There is no way around this. Software can't automagically figure out what people have inconsistently entered or when they've broken their own numbering convention. You're going to have to figure out what the customer intended with or without software. All you have to do is type it into a web form instead of Excel. Once you've copied and pasted the RFP, you can look up RFP references with simple clicks. This is not only true during cross-referencing, but it remains true throughout Proposal Content Planning and the rest of the process. The full-text of the RFP is always just one click away. You also have to enter your proposal outline. We also kept this extremely simple. If you need a new heading, just number and name it. For you touch typists, you can cross-reference your outline and the RFP straight from the forms by typing in the first few letters of an RFP heading in the link field. I tend to go back and forth depending on which feels more convenient in that moment. Our goal is to make data entry quicker than you can think through understanding the RFP. And then to help speed up being able to figure it all out with one-click look-ups and drag and drop linking. Since you can't help but think of things that impact the writing, there's also a place in both RFP entry and proposal outline entry where you can enter notes that will flow forward to your Proposal Content Plan. You can also use the notes to explain your judgment calls when the RFP is not clear and you have to choose what to do about it. And to help you get up to speed on it, we're going to start a free 12-week training program for early adopters. Act now... To give us a big incentive to keep this production beast on schedule, we're lowering our prices until the end of April or until we start the training. If you already have a single user subscription, you can add 4 friends for $1000.